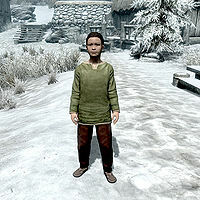 Alesan is a Redguard child who lives in Dawnstar. He makes money by bringing food to the miners of Quicksilver Mine and Iron-Breaker Mine. He sleeps on a bedroll at the Windpeak Inn every night between 9pm and 8am. He wakes up to go straight to work, running through the town and delivering food from the inn workers, Karita and Thoring, to the local miners: Gjak, Karl, Lond, and Borgny. At 6pm, he switches to feeding the chickens outside the inn, and can be seen carrying a handled basket. He wears a set of child's clothes and shoes and carries two loaves of bread and a goat cheese wedge, along with an assortment of random food and toys. If the time is between 8am and 6pm, he will be busy doing his job, and will tell you such as he runs past you: "Sorry! Gotta run! ", "One side, comin' through! ", "Move it, move it! ", or "I'm late! Gotta run!" If you approach him when it is at least 6pm, he may complain by saying, "I'm so tired..." or "Whew! I'm worn out." He will say, "Nice talkin' with you." after you end conversation with him. You can ask him what he's running for or where his parents are. If you ask why he's in a hurry, he'll answer, "I'm running food and supplies to the miners. Don't pay much, but they let me sleep by the fire in the inn most nights." If you inquire about his parents, he'll sadly inform you, "They're... dead. My pa was a sailor. Took me with him on his last trip. After he got sick, they... put us off here and left without us. He... died a few days later. I've tried to make do since then, but... it's been hard. Real hard." You will then have a dialogue option to adopt him. You can only go through with the adoption if you have a house with a child's bed and container. Alesan is the only child in Dawnstar. If you adopt him, Alesan may sometimes not be able to receive gifts. If you adopt him, Alesan can get stuck in a loop, entering and exiting the cellar repeatedly, similar to Lydia sitting and rising from the chair in Breezehome. ? Talking to Alesan and having him do something may fix this. This page was last modified on 7 July 2016, at 07:56.